For the officer of arms, see New Zealand Herald Extraordinary. The New Zealand Herald is a daily newspaper published in Auckland, New Zealand, owned by New Zealand Media and Entertainment. It has the largest newspaper circulation of all newspapers in New Zealand, peaking at over 200,000 copies in 2006, although circulation of the daily Herald had declined to 115,213 copies on average by December 2017. Its main circulation area is the Auckland region. It is also delivered to much of the north of the North Island including Northland, Waikato and King Country. The New Zealand Herald was founded by William Chisholm Wilson, and first published on 13 November 1863. Wilson had been a partner with John Williamson in the New Zealander, but left to start a rival daily newspaper as he saw a business opportunity with Auckland's rapidly growing population. He had also split with Williamson because Wilson supported the war against the Māori (which the Herald termed "the native rebellion") while Williamson opposed it. The Herald also promoted a more constructive relationship between the North and South Islands. After the New Zealander closed in 1866 The Daily Southern Cross provided competition, particularly after Julius Vogel took a majority shareholding in 1868. The Daily Southern Cross was first published in 1843 by William Brown as The Southern Cross and had been a daily since 1862. Vogel sold out of the paper in 1873 and Alfred Horton bought it in 1876. In 1876 the Wilson family and Horton joined in partnership and The New Zealand Herald absorbed The Daily Southern Cross. In 1879 the United Press Association was formed so that the main daily papers could share news stories. The organisation became the New Zealand Press Association in 1942. In 1892, the New Zealand Herald, Otago Daily Times, and Press agreed to share the costs of a London correspondent and advertising salesman. The New Zealand Press Association closed in 2011. The Wilson and Horton families were both represented in the company, known as Wilson & Horton, until 1996 when Tony O'Reilly's Independent News & Media Group of Dublin purchased the Horton family's interest in the company. The Herald is now owned by New Zealand Media and Entertainment. That company is owned by Sydney-based APN News & Media and the Radio Network, owned by the Australian Radio Network. Dita de Boni was a columnist for the newspaper, writing her first columns for the NZ Herald in 1995. From 2012 - 2015 she wrote a business and politics column until – after a series of articles increasingly critical of the Key government – the Herald discontinued her column for financial reasons. Gordon Minhinnick was a staff cartoonist from the 1930s until his retirement in the 1980s. Malcolm Evans was fired from his position as staff cartoonist in 2003 after the newspaper received complaints about his cartoons on the conflict between Israel and Palestine. Laurence Clark was the daily political cartoonist from 1987 to 1996, and continued to publish cartoons weekly in the Herald until 2000. On 10 September 2012, the Herald moved to a compact format for weekday editions, after 150 years publishing in broadsheet format. The broadsheet format was retained for the Saturday edition. In April 2007, APN NZ announced it was outsourcing the bulk of the Herald's copy editing to an Australian-owned company, Pagemasters. In November 2012, two months after the launch of its new compact format, APN News and Media announced it would be restructuring its workforce, cutting eight senior roles from across the Herald's range of titles. The Herald is traditionally a centre-right newspaper, and was given the nickname "Granny Herald" into the 1990s. This changed with the acquisition of the paper by Independent News & Media in 1996, and today, despite remaining free enterprise oriented on economic matters such as trade and foreign investment, the Herald is generally editorially progressive on international geopolitics, diplomacy, and military matters, printing material from British newspapers such as The Independent and The Observer but more recently, conservative newspapers such as The Daily Telegraph. It also regularly reprints syndicated material from the socially and politically conservative, right-wing British tabloid the Daily Mail. The Herald's stance on the Middle East is supportive of Israel, as seen most clearly in its 2003 censorship and dismissal of cartoonist Malcolm Evans following his submission of cartoons critical of Israel. On domestic matters, editorial opinion is centrist, usually supporting socially conservative values. In 2007, an editorial strongly disapproved of some legislation introduced by the Labour-led government, the Electoral Finance Act, to the point of overtly campaigning against the legislation. In July 2015, the New Zealand Press Council ruled that Herald columnist Rachel Glucina had failed to properly represent herself as a journalist when seeking comment from Amanda Bailey on a complaint she had made about Prime Minister John Key repeatedly pulling her hair when he was a customer at the cafe in which she worked. The Herald published Bailey's name, photo, and comments after she had retracted permission for Glucina to do so. The council said there was an “element of subterfuge” in Glucina's actions and that there was not enough public interest to justify her behaviour. In its ruling the council said that, “The NZ Herald has fallen sadly short of those standards in this case.” The Herald's editor denied the accusations of subterfuge. Glucina subsequently resigned from the newspaper. In 1998 the Weekend Herald was set up as a separate title and the newspaper's website was launched. A compact-sized Sunday edition, the Herald on Sunday, was first published on 3 October 2004 under the editorship of Suzanne Chetwin and then, for five years, by Shayne Currie. 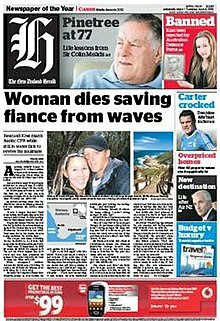 It won Newspaper of the Year for the calendar years 2007 and 2009 and is New Zealand's second-highest-circulating weekly newspaper after the more established and conservative broadsheet, The Sunday Star-Times. In 2010, the Herald on Sunday started a campaign to reduce the legal blood alcohol limit for driving in New Zealand, called the "Two Drinks Max" campaign. The paper set up a campaign Facebook page, a Twitter account, and encouraged readers to sign up to the campaign on its own website. It is currently edited by Miriyana Alexander. The newspaper's online news service, originally called Herald Online, was established in 1998. It was redesigned in late 2006, and again in 2012. The site was named best news website at the 2007 and 2008 Qantas Media Awards, won the "best re-designed website" category at the 2007 New Zealand NetGuide Awards, and was one of seven newspaper sites named an Official Honouree in the 2007 Webby Awards. On a wreath of the colours two Trumpets in saltire Or bound together by a Maori Taniko in the shape of the letter H proper. Per chevron Azure and Gules in chief on a Pale Or between a representation of the Constellation of the Southern Cross and a Lymphad sails furled oars in action Argent a Sword point upwards Gules in base a Caduceus Or. ^ "Murray Kirkness appointed new editor of New Zealand Herald". The New Zealand Herald. 18 June 2015. ^ "Newspaper Audit Process". newspaper.abc.org.nz. ^ "ABC statistics". New Zealand Audit Bureau of Circulation. Retrieved 11 March 2018. ^ "More eyes on the Herald as readership rises to 844,000 a day". NZME. Publishing Limited. New Zealand Herald. 7 November 2014. Retrieved 21 August 2015. ^ "The Daily Southern Cross". National Library of New Zealand - Te Puna Mātauranga o Aotearoa. Retrieved 30 October 2012. ^ a b "New Zealand Herald". Papers Past. National Library of New Zealand. Retrieved 15 September 2012. ^ "New Zealander". Papers Past. National Library of New Zealand. Retrieved 15 September 2012. ^ a b "Daily Southern Cross". Papers Past. National Library of New Zealand. Retrieved 23 March 2012. ^ Horton, Michael (1 September 2010). "Horton, Alfred George". Dictionary of New Zealand Biography. Ministry for Culture and Heritage. Retrieved 15 September 2012. ^ Brown, Russell. "Everybody has one". Public Address. Retrieved 28 August 2015. ^ "Cartoonist Sacked after Being Accused of Anti-Semitism." http://www.smh.com.au/articles/2003/08/14/1060588531032.html. New Zealand Press Association, 15 Aug. 2003. Web. 21 Aug. 2015. <http://www.smh.com.au/articles/2003/08/14/1060588531032.html>. ^ "Bio". Klarc.co.nz. Retrieved 20 February 2009. ^ "New look Herald smaller and bigger". The New Zealand Herald. 9 July 2012. Retrieved 9 July 2012. ^ "Eight jobs to go in Herald restructure". 3 News NZ. 9 September 2012. ^ "Furore over sacking of Kiwi cartoonist". Scoop.co.nz. 1 September 2003. Retrieved 31 January 2012. ^ "Editorial: Democracy under attack". The New Zealand Herald. 12 November 2007. Retrieved 27 January 2010. ^ "A brief history of The New Zealand Herald". NZ Herald. NZME. Retrieved 21 August 2015. ^ "Editorial: Two Drinks Max: Sign up and make us safer". The New Zealand Herald. 24 October 2010. ^ "nzherald.co.nz". nzherald.co.nz. 17 March 2011. Retrieved 31 January 2012. ^ "Herald website judged best news site". The New Zealand Herald. 19 May 2007. Retrieved 21 November 2011.